Bundle up. 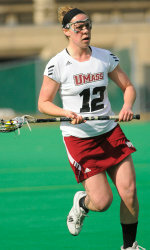 UMass Lacrosse season starts Saturday…. In 2007 a member of the University of Vermont Men’s Lacrosse Team was diagnosed with testicular cancer. As a result, a lot was learned about the disease and what a young man must endure to combat it. Although he was not treated there, Dana-Farber Cancer Institute helped with the diagnoses and discussion of his treatment options. After going through surgery, radiation and chemotherapy our player is in full remission, but we felt this was a cause that we should continue to be involved with.